When you have kids in college (like I do), one thing you become accustomed to is the coming and going of your children—teens, young adults. And you may become accustomed (like we have) to the “Dad run” or “Mom run”—the trip to drop off or pick up a kid from college. It is a trip that, for us, involves lengthy out of state car travel, all over the eastern seaboard: Vermont, Massachusetts, New Hampshire, Connecticut, New York, New Jersey, Rhode Island, Pennsylvania. I kid you not, between college tours, dropping off/picking up, and internships, these are places I am an accidental, pass through tourist on a semi-regular basis. And these trips, although sometimes fun, are mostly very business-oriented: pack up and drop off or pick up and pack up. Or very emotional: big goodbye hug followed by lots of tears (mine) then a long solo drive home. Or the best: a long-awaited hug followed by a long drive home full of happy conversation and news. Sometimes these trips involve exciting sightseeing: new cities, horse farms, beaches, zoos, tours of ice cream factories, museums, hiking and walking trails; but often fairly mundane: Target, grocery stores, hardware stores. Many times it’s also a great excuse to try a new restaurant or visit a college bookstore—we always do that! I think you might guess where this is leading. Yes, I just returned home from a Mom run. My daughter—home for the first part of the summer—is now off to another state to do an internship. I drove her and a huge carload of stuff 8 hours in a GINORMOUS rented SUV. I wasn’t really familiar with most of its features and it was about twice as big as the car I usually drive. The way there was great fun! I love traveling with my daughter—we talked and laughed and listened to music and had a wonderful time. She: anticipating the fun of the internship and life on her own; me: just basking in the joy of being with my wonderful daughter. The problems with the rented car muted by the good times. There I was in an unfamiliar huge car (that felt even bigger with just me in it) on that huge bridge with about 12,500 other people (rough calculation, give or take). But not one of those 12,500 people would give me an inch, and I was sure I would run into someone with the ginormous car, and I was terrified—at points near tears. Don’t get me wrong, I love the bridge. It’s beautiful, and I love the view. But I do not like the prospect of being smushed into smush by four zillion semi-trucks surrounding me at any given moment. And the George Washington Bridge has also come to represent goodbye and hello. Hence, I always look forward to seeing the bridge when I’m heading southward, but dread it when heading north. About five or so hours after crossing the George Washington Bridge, I cross the Piscataqua River Bridge—going from New Hampshire to Maine. This bridge has come to represent coming home (or to my kids, saying goodbye to home). Again: goodbye and hello. Wild, sparsely populated Maine welcomes me home to the place I feel most comfortable living, but also much too far away from the part of my heart I left on the other side of that other bridge. These two bridges have become an integral part of my life with my children—linking me to them both physically and emotionally. Where once we were all under the same roof in a small town sharing our daily lives, I now traverse those bridges to see them: representing their transition from our nuclear and protected family, childhood to adulthood, as they enter the world that beckons them to explore. And so it is that next month will find me, crossing both bridges again, full of anticipation without dread—once again braving the prospect of being smushed—heading back for that long-awaited hug. Wow, what an amazing journey to take semi-frequently! I like bridges, but we don’t have any that are huge and amazing around Perth. I’ve been across a couple of awesome ones when I was visiting Stateside. The endless sea of cars! Gah! Beautiful. I love the way you used the bridges. I know it is a busy and intimidating route at times, but from where I’m sitting here in the middle of cornfields, I think it’s pretty awesome that you get to drive through all these cool places. I’ll guess you’ll need to rent the SUV again. . .
Tell her to pack light next time. Aww. Your post makes me want to hug my 13 and 11 year old a little tighter today. Bridges are so cool, symbolically, for so many things. And hey, I give you a lot of credit for venturing out alone in an unfamiliar SUV through (via?) New York when you’re used to a smaller town. As far as being smushed, at least you didn’t rent a Smart Car for this trip! :O THAT would be nerve wracking if you were stuck between semis in one of those. (((Hugs))) to you as you settle back into your summertime routine, sans your daughter. What a great post! I was deeply connected with the Coronado Bay Bridge when I lived in Coronado (beautiful place). I worked in San Diego….but LOVED crossing it when I picked up my step-son serving in the Marines at Camp Pendleton. It was weird….Coronado is a peninsula right off the coast of San Diego and was VERY small and then….BAM! City traffic right off the bridge. Then thru L.A. which is a nightmare! I know exactly where you’re at on this post….thank you! Christine, The drives are cool, and they are really fun when I’m not alone (when my husband & I make the trip together, it’s better, but often not feasible with jobs, the old dog, not enough room in the car, etc.). Believe me, she’s a super organized, light, packer — just happened to be given that vehicle by the rental place. NEVER AGAIN! Ann, I absolutely LOVE the Coronado Bay Bridge and San Diego (have you ever checked out Leahsthoughts blog? she writes from San Diego!) Yes, LA is a definite nightmare — I grew up in Southern California so I know exactly what you mean! Now THAT is traffic, nonstop from SD to LA! What a physical and emotional journey. And especially when you do it so often and across so many states. That takes some emotional resilience. I can totally and utterly relate to the stress of going from Smallsville on a road trip into the frenzy of big places and dealing with scary stuff like the GW Bridge. Add in a strange larger vehicle and that’s my idea of mega-stress. I haven’t had to do anything like that for a while but I know I’d be a wreck if I had to. I love how you turned your roller coaster of emotions into such an absorbing post. I felt like I was on the journey with you. I wish all the best for your daughter’s internship. Hope she’s settling in well during her first few days. Beautiful, Julia. How sweet, too, that you and your daughter are great travel partners. I hope to have that with my kids one day. Right now our travels involve Spongebob and a lot of bribes. But seriously, the bridge is a great symbol for this part of life for you. I love the way you tie so much together through the images of these two bridges. Beautiful. My daughters are 4 and 7, and I’m going to get in some extra hugs today. As for the GW Bridge — it is overwhelming! Kudos to you for driving it on your own in a monster car. That’s bravery. A lovely post, as usual. I’m deathly afraid of driving on bridges. I see the water through the slats, and oh, my heart…it drops. You are a brave woman! Julia, I feel this way about the Golden Gate and the Bay Bridge. My father was a construction steel inspector for the state of California and worked on both of them. I can’t see a photo of a beautiful bridge without thinking of all the stories he’d bring home of weird things that happened on them. SO beautifully written, Julia. Bridges are so symbolic, and you captured that symbolism so effortlessly. If it’s any consolation, I’d have been freaked out, too, on the bridge. My stomping grounds is even smaller than yours … though I did get used to crazy drivers in Phoenix, I suspect it’s not quite the same as New Yorkers’ driving habits. But then again, most AZ residents are transplants from the east coast … so maybe it is the same? GIve me my country roads and jackrabbits any time. BTW – I know I’ve said it before, but your kids are so lucky to have such a wonderfully supportive and loving mama! Just read your post on Molly Hacker’s blog and I can see why you two are so likeminded. 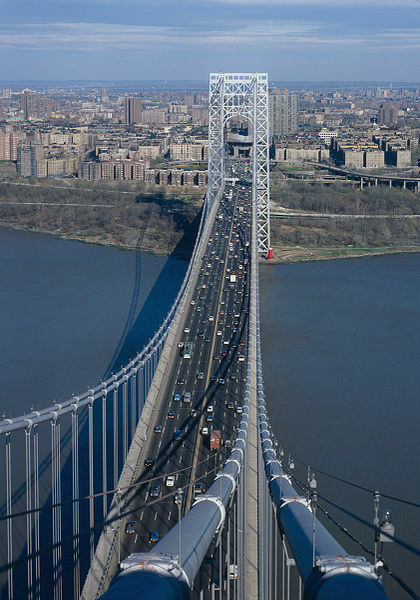 I could so easily feel your panic on the GW bridge, especially in a larger, unfamiliar car. I would have been in tears — no doubt. It’s too bad that the only bridges between you and your children aren’t just the symbolic ones. I hope future trips are MUCH easier. Amanda, I’m glad you enjoyed the post — and that you see my fear of the bridges! 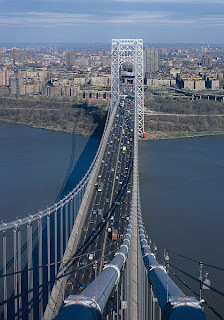 When I was stuck in stopped traffic on the upper level of the GW Bridge, I could actually feel the bridge vibrating with the traffic! TERRIFYING! It’s easier when my husband, the engineer, is along because (a) he tells me why it’s so safe, and (b) he LOVES the thrill of the bridge. ME? I’m with you: deathly afraid! Cynthia, What a lovely story about the Golden Gate and Bay bridges! I used to live in the Bay Area and drove across the Bay Bridge everyday. I have so much admiration for people like your dad who build bridges. And I can only imagine the weird stories he’d tell! Perhaps a good blog?! Melissa, I’m so glad you enjoyed the post…I agree about the symbolism of bridges, and I appreciate your comment that I captured it. And I wholeheartedly agree that I’d rather have country roads and jackrabbits, any day of the week. Sheesh, those cityfolk TERRIFY ME 🙂 p.s. thanks also for the supportive mama compliment — can’t say it enough that my two wonderful kids make it easy to be a wonderful mom! Lisette, Thanks so much for the comment and the visit to my blog! I think Molly and I have a ton in common in this department…. I told my husband that for a few moments I looked around at the total gridlock and mayhem, thinking all I wanted to do was cry, then I said to myself: “Get a grip, just inch forward little by little, and everything will be alright!” And LOL, after my little self-peptalk, I was okay! I agree, just symbolic bridges would be a WHOLE LOT EASIER!! What a beautiful post, Julia! We might have been on the road, corssing those same bridges on the same day! I can just imagine you and your daughter and the joyous noise of the two of you on the road. The month will fly and that next hug is around the corner. Now I better stop there before I start to cry! Erika, Thank you! These transitions — both the emotional and the physical — have been difficult so I appreciate your kind words so much. It was a wonderful road trip together, and I am literally counting the days to that next hug…. I’ve been on both bridges and can relate to the stress of driving on the GW. In fact, driving anywhere in New York would stress me out. And then you have the more peaceful bridge to Maine Such interesting symbolism for the two types of trips you’re talking about here. Investigate that further for some deeper meaning about connection. Enjoyed the musings here, as your thoughts remind me of my days on the road with my kids when they were moving in and out of new lives on their own. Very powerful and emotional times those were. Bike Lady, I’m happy you enjoyed the post! Yes, I would say these are possibly the most trying times I can remember of my adult life, quite transitional and challenging! Thanks so much for your comment and visit to my blog! What a beautiful piece! I love how you used bridges to illustrate the journeys and bonding with your children. It’s hard to imagine that those days with Sophie won’t be too far in the future. I hope my journeys are as nice as yours! First of all, I grew up near Pittsburgh where we have plenty of rivers and lots and lots of bridges. This post evoked all my favorites for me, and I really enjoyed it for that. And that was all it took. I was okay after that. And obviously David Byrne and I are cosmically intertwined; at the very least he is the patron saint of people like you and me. Throw that song on your mp3player for the ride to bring your girl back home after her internship, if you need to rent a large automobile.